I'm loving this Springy room by Todd Klien today. It's suppose to be at least 80 degrees in Boston today! I don't have class because its Spring Break, so I booked myself a facial this afternoon. Goodbye Winter skin, hello Spring skin. Love it...I'm gonna have do do a craigslist this space on it I think :)! Sounds like the perfect spring day. Enjoy! Also, that room is gorgeous! Good for you and I love the mint walls! love your color dot posts:) can't wait to crash your apartment for book club!!!!!!!!!!!!!!!!!!!!! Mmmm minty fresh walls. Love it. Oh, i LOVE that room. 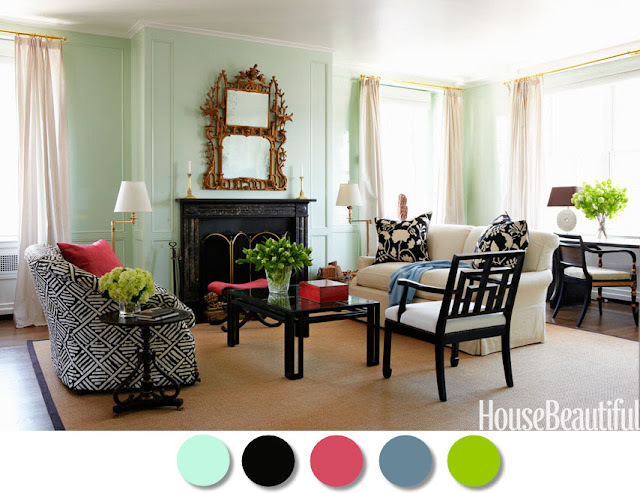 Love the black chairs against that pale mint green. Yummy.